Danys, K. (2016). Pottery from Dongola: a stratigraphic assemblage from unit B.I.41. Polish Archaeology in the Mediterranean, 25, 761–779. Danys, K. (2015). Amphorae from Building SWN.B.I in Dongola. In W. Godlewski and D. Dzierzbicka (eds), Dongola 2012–2014. Fieldwork, conservation and site management (=PCMA Excavation Series 3) (pp. 117–151). Warsaw: PCMA UW. Dzierzbicka, D. (2015). Amphora stoppers of the 7th century from Old Dongola. In W. Godlewski and D. Dzierzbicka (eds), Dongola 2012–2014. Fieldwork, conservation and site management (=PCMA Excavation Series 3) (pp. 153–168). Warsaw: PCMA UW. Godlewski, W. (2015). Building SWN.B.V: The Church of Raphael. In W. Godlewski and D. Dzierzbicka (eds), Dongola 2012–2014. Fieldwork, conservation and site management (=PCMA Excavation Series 3) (pp. 53–64). Warsaw: PCMA UW. Godlewski, W. with appendix by R. Mahler. (2015). Dongola. Seasons in 2012–2013. Polish Archaeology in the Mediterranean, 24/1, 325–343. Godlewski, W. (2015). SWN.B.I.E: Residential quarter of the Funj period (17th century). In W. Godlewski and D. Dzierzbicka (eds), Dongola 2012–2014. Fieldwork, conservation and site management (=PCMA Excavation Series 3) (pp. 223–232). Warsaw: PCMA UW. Godlewski, W. (2015). The architecture of the Central Hall. In W. Godlewski and D. Dzierzbicka (eds), Dongola 2012–2014. Fieldwork, conservation and site management (=PCMA Excavation Series 3) (pp. 15–24). Warsaw: PCMA UW. Godlewski, W. (2015). The fortifications of Dongola and houses to the north of the Citadel. In W. Godlewski and D. Dzierzbicka (eds), Dongola 2012–2014. Fieldwork, conservation and site management (=PCMA Excavation Series 3) (pp. 183–214). Warsaw: PCMA UW. Godlewski, W. (2015). The southwestern part of Kom H in Dongola: research on the monastic gates and protection work in the cemeteries. In W. Godlewski and D. Dzierzbicka (eds), Dongola 2012–2014. Fieldwork, conservation and site management (=PCMA Excavation Series 3) (pp. 273–284). Warsaw: PCMA UW. Godlewski, W., Danys, K., and Osypińska, M. (2015). Palatial Building SWN.B.I and earlier relics of Buildings SWN.B.IV and SWN.B.X. In W. Godlewski and D. Dzierzbicka (eds), Dongola 2012–2014. Fieldwork, conservation and site management (=PCMA Excavation Series 3) (pp. 65–84). Warsaw: PCMA UW. Godlewski, W. and Dzierzbicka, D. (eds). (2015). Dongola 2012–2014. Fieldwork, conservation and site management (=PCMA Excavation Series 3). Warsaw: PCMA UW. Łajtar, A. (2015). A quotation from Saint Basil’s De jejunio homilia prima 1 in a wall inscription from the Southwest Annex of the Monastery on Kom H in Dongola. In W. Godlewski and D. Dzierzbicka (eds), Dongola 2012–2014. Fieldwork, conservation and site management (=PCMA Excavation Series 3) (pp. 289–292). Warsaw: PCMA UW. Łajtar, A. (2015). Wall inscriptions in church SWN.B.V on the Citadel of Dongola. In W. Godlewski and D. Dzierzbicka (eds), Dongola 2012–2014. Fieldwork, conservation and site management (=PCMA Excavation Series 3) (pp. 111–116). Warsaw: PCMA UW. Łajtar, A. (2015). Wall inscriptions in the Southwest Annex to the Monastery on Kom H at Dongola: Report on work in the 2013 season. Polish Archaeology in the Mediterranean, 24/1, 344–351. Mahler, R., Godlewski, W., Danys-Lasek, K., and Czaja, B. (2015). Crypt 3 in the Northwest Annex of the Monastery on Kom H in Dongola: Report on the exploration in 2012. Polish Archaeology in the Mediterranean, 24/1, 352–368. Maślak, S. (2015). Bricks and brick structures in the western part of site SWN on the Citadel. In W. Godlewski and D. Dzierzbicka (eds), Dongola 2012–2014. Fieldwork, conservation and site management (=PCMA Excavation Series 3) (pp. 85–102). Warsaw: PCMA UW. Maślak, S. (2015). Houses of the Funj period outside the Citadel: materials and structures. In W. Godlewski and D. Dzierzbicka (eds), Dongola 2012–2014. Fieldwork, conservation and site management (=PCMA Excavation Series 3) (pp. 215–222). Warsaw: PCMA UW. Vantieghem, N. (2015). Documents arabes trouvés à Dongola. In W. Godlewski and D. Dzierzbicka (eds), Dongola 2012–2014. Fieldwork, conservation and site management (=PCMA Excavation Series 3) (pp. 235–238). Warsaw: PCMA UW. Zielińska, D. (2015). Painted decoration of the Central Hall: preliminary report. In W. Godlewski and D. Dzierzbicka (eds), Dongola 2012–2014. Fieldwork, conservation and site management (=PCMA Excavation Series 3) (pp. 25–36). Warsaw: PCMA UW. Zielińska, D. (2015). The painted decoration of Building SWN.B.V (Royal Church) on the Citadel: state of research. In W. Godlewski and D. Dzierzbicka (eds), Dongola 2012–2014. Fieldwork, conservation and site management (=PCMA Excavation Series 3) (pp. 103–110). Warsaw: PCMA UW. Danys-Lasek, K. (2014). Dongola: Pottery from Building B.VI (Site C.01), seasons 2010–2011. Polish Archaeology in the Mediterranean, 23/1, 311–321. Godlewski, W. (2014). Dongola 2010–2011. Polish Archaeology in the Mediterranean, 23/1, 265–284. Łajtar, A. (2014). Dongola 2010: Epigraphic report. Polish Archaeology in the Mediterranean, 23/1, 285–295. Łajtar, A. (2014). Epitaph of Staurosaña (†1057), granddaughter (?) of a king Zakharias, found in Dongola. In A. Lohwasser and P. Wolf (eds), Ein Forscherleben zwischen den Welten. Zum 80. Geburtstag von Steffen Wenig (pp. 221–228). Berlin: Sudanarchäologische Gesellschaft zu Berlin. Martens-Czarnecka, M. (2014). Nubian representations of Nativity discovered in the Monastery in Old Dongola. In J.R. Anderson and D.A. Welsby (eds), The Fourth Cataract and beyond: Proceedings of the 12th International Conference for Nubian Studies (=British Museum Publications on Egypt and Sudan 1) (pp. 917–927). Leuven: Peeters. Obłuski, A. (2014). Excavation at site C.01 on the citadel of Tungul (Old Dongola), Sudan: Preliminary report. Polish Archaeology in the Mediterranean, 23/1, 296–310. Osypińska, M. (2014). Animal husbandry and meat consumption in Makurite Dongola, Sudan. Faunal evidence from the royal residence area, 6th–17th century. Archeologia, 64, 67–81. Godlewski, W. (2013). Archbishop Georgios of Dongola. Socio-political change in the kingdom of Makuria in the second half of the 11th century. Polish Archaeology in the Mediterranean, 22, 663–677. Godlewski, W. (2013). Dongola: Ancient Tungul. Archaeological guide (=PCMA Archaeological Guides 1). Warsaw: Polish Centre of Mediterranean Archaeology, University of Warsaw. Godlewski, W. (2013). Dongola, Sudan: excavations in 2012. Światowit, 10 (51) Fasc. A, 185–192. Godlewski, W. (2013). Dongola, Sudan: excavations in 2012–2013. Światowit, 11 (52) Fasc. A, 233–240. Godlewski, W. (2013). The kingdom of Makuria in the 7th century. The struggle for power and survival. In C.J. Robin and J. Schiettecatte (eds), Les préludes de l’Islam : ruptures et continuités dans les civilisations du Proche-Orient, de l’Afrique orientale, de l’Arabie et de l’Inde à la veille de l’Islam (pp. 85–104). Paris: De Boccard. Godlewski, W. and Łajtar, A. (2013). Dongola. In Voices from the Nile Valley: Polish archaeology between Alexandria and Dongola. Warsaw: Warsaw University Press. Obłuski, A., Godlewski, W., Kołątaj, W., Medeksza, S., and Calaforra-Rzepka, C. (2013). The Mosque Building in Dongola. Conservation and revitalization project. Polish Archaeology in the Mediterranean, 22, 248–272. Osypińska, M. (2013). Archaeozoological research on animal remains from excavations in Dongola (Sudan) in 2010. Polish Archaeology in the Mediterranean, 22, 229–247. post-Makurian Dongola in Nubia. Preliminary assessment. Polish Archaeology in the Mediterranean, 22, 679–720. Danys-Lasek, K. (2012). Dongola 2009: Pottery from Building I (Kom A). Polish Archaeology in the Mediterranean, 21, 315–329. Godlewski, W. with appendix by C. Calaforra-Rzepka. (2012). Dongola 2008–2009. Polish Archaeology in the Mediterranean, 21, 289–314. Godlewski, W. (2012). Washtub from the Palace of Ioannes in Dongola. Études et Travaux, 25, 119–125. Godlewski, W., Mahler, R., and Czaja-Szewczak, B. (2012). Crypts 1 and 2 in the Northwest Annex of the Monastery on Kom H in Dongola: Report on the exploration in 2009. Polish Archaeology in the Mediterranean, 21, 338–360. Łajtar, A. and van der Vliet, J. (2012). 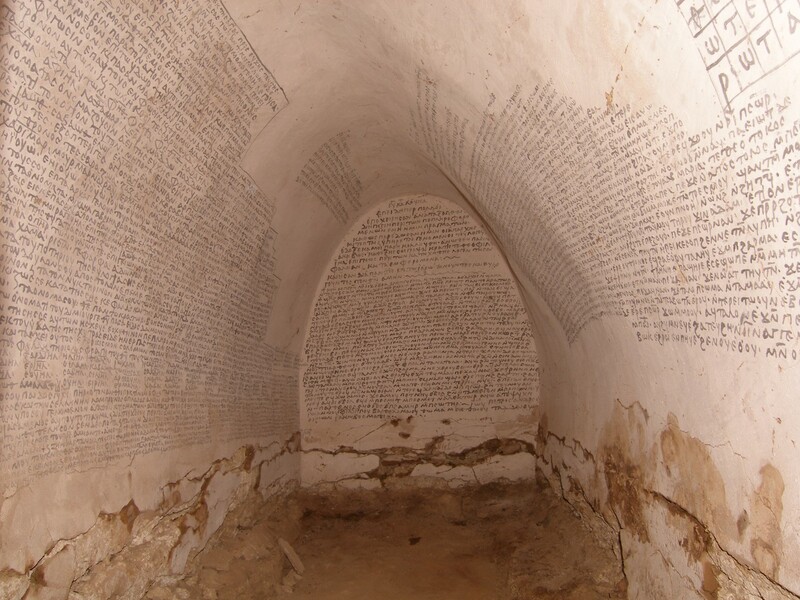 Wall inscriptions in a burial vault under the Northwest Annex of the Monastery on Kom H (Dongola 2009). Polish Archaeology in the Mediterranean, 21, 330–337. Danys-Lasek, K. and Łajtar, A. (2011). An amphora with a Graeco-Nubian inscription found at Dongola. In A. Łajtar and J. van der Vliet (eds), Nubian voices: Studies in Christian Nubian culture (=Journal of Juristic Papyrology Supplement 15) (pp. 37–94). Warsaw: Journal of Juristic Papyrology. Godlewski, W. (2011). Mosaic floor from the sanctuary of the EC.II cathedral in Dongola. In H. Meyza and I. Zych (eds), Classica orientalia: Essays presented to Wiktor Andrzej Daszewski on his 75th birthday (pp. 193–198). Warsaw: Polish Centre of Mediterranean Archeology, University of Warsaw; Wydawnictwo DiG. Jakobielski, S. and van der Vliet, J. (2011). From Aswan to Dongola: The epitaph of bishop Joseph (died AD 668). In A. Łajtar and J. van der Vliet (eds), Nubian voices: Studies in Christian Nubian culture (=Journal of Juristic Papyrology Supplement 15) (pp. 15–35). Warsaw: Journal of Juristic Papyrology. Lichocka, B. (2011). The 12 Nummia coin from Old Dongola. Polish Archaeology in the Mediterranean, 20, 245–249. Łajtar, A. (2011). New finds of Greek epitaphs at Dongola. In A. Łajtar and J. van der Vliet (eds), Nubian voices: Studies in Christian Nubian culture (=Journal of Juristic Papyrology Supplement 15) (pp. 37–94). Warsaw: Journal of Juristic Papyrology. Martens-Czarnecka, M. (2011). The wall paintings from the Monastery on Kom H in Dongola (=Nubia 3; Dongola 3; PAM Monograph Series 3). Warsaw: PCMA, Warsaw University Press. Gazda, D. (2010). Excavations at the Monastery Church on Kom H at Old Dongola 2002/2003–2006. Gdańsk Archaeological Museum African Reports, 6, 41–60. Godlewski, W. (2010). Dongola after the 2008–2010 seasons: Royalty, saints and blessed bishops. Sudan & Nubia, 14, 75–82. Godlewski, W. (2010). Old Dongola. Kom A (Citadel), 2007. Polish Archaeology in the Mediterranean, 19, 313–326. Godlewski, W. and Kociankowska-Bożek, J. (2010). Early Makuria Research Project. Season 2007. Polish Archaeology in the Mediterranean, 19, 494–499. Jakobielski, S. (2010). The Holy Trinity Monastery in Old Dongola. Excavations 2002/2003–2006. Gdańsk Archaeological Museum African Reports, 6, 69–90. Martens-Czarnecka, M. (2010). New iconographical elements in Old Dongola painting. Gdańsk Archaeological Museum African Reports, 6, 119–124. Martens-Czarnecka, M. (2010). Two unique paintings in the monastery on Kom H in Old Dongola. In W W. Godlewski and A. Łajtar (eds), Between the cataracts: Proceedings of the 11th Conference for Nubian studies, Warsaw University, 27 August – 2 September 2006, II.2. Session papers (=PAM Supplement Series 2.2/2) (pp. 705–712). Warsaw: Warsaw University Press. Pluskota, K. (2010). The pottery from Old Dongola – selected questions. In W. Godlewski and A. Łajtar (eds), Between the cataracts: Proceedings of the 11th Conference for Nubian studies, Warsaw University, 27 August – 2 September 2006, II.1. Session papers (=PAM Supplement Series 2.2/1) (pp. 255–262). Warsaw: Warsaw University Press. Zielińska, D. (2010). Edifice without parallel: Cruciform Building on the Old Dongola citadel. In W. Godlewski and A. Łajtar (eds), Between the cataracts: Proceedings of the 11th Conference for Nubian studies, Warsaw University, 27 August – 2 September 2006, II.2. Session papers (=PAM Supplement Series 2.2/2) (pp. 695–703). Warsaw: Warsaw University Press. Bagińska, D. (2008). Christian pottery from Old Dongola (Kom H). Polish Archaeology in the Mediterranean, 18, 361–375. Gazda, D. (2008). The Monastery Church on Kom H in Old Dongola after two seasons of excavations in 2006. Polish Archaeology in the Mediterranean, 18, 349–360. Godlewski, W. (2008). MtoM. Early Makuria Research Project, season 2006. Polish Archaeology in the Mediterranean, 18, 463–476. Jakobielski, S. (2008). The Holy Trinity Monastery in Old Dongola. In W. Godlewski and A. Łajtar (eds), Between the cataracts: Proceedings of the 11th Conference for Nubian studies, Warsaw University, 27 August – 2 September 2006, I. Main papers (=PAM Supplement Series 2.1) (pp. 283–302). Warsaw: Warsaw University Press. Jakobielski, S. and Martens-Czarnecka, M. (2008). Old Dongola. Fieldwork, seasons 2005/2006 and 2006. Polish Archaeology in the Mediterranean, 18, 325–342. Martens-Czarnecka, M. (2008). A scene of ritual dance (Old Dongola – Sudan). Études et Travaux, 22, 115–125. Osypińska, M. (2008). Faunal remains from the monastery in Old Dongola (Kom H). Season 2006. Polish Archaeology in the Mediterranean, 18, 376–384. Godlewski, W. (2007). King Qalidurut’s Dongola: Arabic sources and archaeology. In B. Gratien (ed. ), Mélanges offerts à Francis Geus (pp. 131–140). Villeneuve-d’Ascq: Université Charles-de-Gaulle – Lille 3. Godlewski, W. (2007). Old Dongola. Kom A (Acropolis), 2005. Polish Archaeology in the Mediterranean, 17, 287–299. Godlewski, W. (2006). Dongola: City of kings and bishops. Warsaw: PCMA UW. Godlewski, W. (2006). The churches of Dongola, their origin and importance in the general line of development of church architecture in Makuria. In I. Caneva and A. Roccati (eds), Acta Nubica: Proceedings of the X International Conference of Nubian studies, Rome, 9–14 September 2002 (pp. 263–286). Rome: Istituto Poligrafico e Zecca dello Stato, Libreria dello Stato. Jakobielski, S. (ed.). (2006). Polskie wykopaliska w Starej Dongoli: 45 lat współpracy archeologicznej z Sudanem / Polish excavations at Old Dongola: 45 years of the archaeological co-operation with the Sudan. Warsaw: Muzeum Narodowe. Gazda, D. (2005). Monastery Church on Kom H in Old Dongola. Third and fourth season of excavations (2004, 2004/5). Polish Archaeology in the Mediterranean, 16, 285–295. Godlewski, W. (2005). MtoM. Early Makuria Research Project. Polish Archaeology in the Mediterranean, 16, 385–388. Jakobielski, S. (2005). Old Dongola. Fieldwork in 2004. Polish Archaeology in the Mediterranean, 16, 259–272. Martens-Czarnecka, M. (2005). Stylistic homogeneity of groups of paintings in the monastery in Old Dongola. Gdańsk Archaeological Museum African Reports, 3, 159–173. Martens-Czarnecka, M. (2005). Wall paintings discovered in Dongola in the 2004 season. Polish Archaeology in the Mediterranean, 16, 273–284. Pluskota, K. (2005). Amphorae from Old Dongola. Evolution of local products (exploration of kiln R1 F). Gdańsk Archaeological Museum African Reports, 3, 227–232. Godlewski, W. (2004). Old Dongola. In D.A. Welsby and J.R. Anderson (eds), Sudan: Ancient treasures. An exhibition of recent discoveries from the Sudan National Museum (pp. 209–213). London: British Museum Press. Godlewski, W. (2004). Old Dongola. Kom A (Acropolis), 2003. Polish Archaeology in the Mediterranean, 15, 193–215. Osypińska, M. (2004). Animal bone remains from Old Dongola. Osteological material from Building B.I on Kom A. Polish Archaeology in the Mediterranean, 15, 224–230. Zielińska, D. (2004). Painted decoration of the Cruciform Building in Dongola. Preliminary report. Polish Archaeology in the Mediterranean, 15, 216–223. Gazda, D. (2003). The Monastery Church on Kom H in Old Dongola 2002. Polish Archaeology in the Mediterranean, 14, 230–236. Godlewski, W. (2003). Dongola: stolica królestwa Makurii (Dongola: the capital of the kingdom of Makuria). Archeologia Żywa, 8(3), 8–11. Jakobielski, S. (2003). Old Dongola. Fieldwork in 2002. Polish Archaeology in the Mediterranean, 14, 211–229. Łajtar, A. (2003). Catalogue of the Greek inscriptions in the Sudan National Museum at Khartoum (I. Khartoum Greek) (=Orientalia lovaniensia analecta 122). Leuven: Peeters. Łajtar, A. and Twardecki, A. (2003). Catalogue des inscriptions grecques du Musée national de Varsovie (=Journal of Juristic Papyrology Supplement 2). Warsaw: Fundacja im. Rafała Taubenschlaga. Martens-Czarnecka, M. (2003). New wall paintings discovered at the Monastery of the Holy Trinity in Old Dongola (Sudan) during the 2000 excavation campaign. Gdańsk Archaeological Museum African Reports, 2, 145–153. Wiewióra, M. (2003). Fortifications in the Southern Dongola Reach of the Nile. In B. Żurawski, Survey and excavations between Old Dongola and Ez-Zuma (=Nubia 2; Southern Dongola Reach Survey 1) (pp. 493–506). Warsaw: Neriton. Żurawski, B. (2003). Survey and excavations between Old Dongola and Ez-Zuma (=Nubia 2; Southern Dongola Reach Survey 1). Warsaw: Neriton. Godlewski, W. (2002). Introduction to the Golden Age of Makuria (9th–11th century). Africana Bulletin, 50, 75–98. Godlewski, W. (2002). Old Dongola. Kom A, 2001. Polish Archaeology in the Mediterranean, 13, 203–216. Łajtar, A. (2002). Georgios, Archbishop of Dongola (†1113) and his epitaph. In T. Derda, J. Urbanik, and M. Węcowski (eds), Euergesias Charin: Studies presented to Benedetto Bravo and Ewa Wipszycka by their disciples (=Journal of Juristic Papyrology Supplement 1) (pp. 159–192). Warsaw: Fundacja im. Rafała Taubenschlaga. Martens-Czarnecka, M. (2002). Die christliche Malerei in Faras und Dongola. Vernissage. Die Zeitschrift zur Ausstellung, 13, 26–33. Grossmann, P. (2001). Bemerkung zur Kirchenarchitektur in Old Dongola, am Rande eines Buches von Przemysław M. Gartkiewicz. In S. Jakobielski and P.O. Scholz (eds), Dongola-Studien: 35 Jahre polnischer Forschungen im Zentrum des makuritischen Reiches (=Bibliotheca Nubica et Aethiopica 7) (pp. 387–393). Warsaw: ZAŚ PAN. Jakobielski, S. (2001). 35 years of Polish excavations at Old Dongola. A fact file. In S. Jakobielski and P.O. Scholz (eds), Dongola-Studien: 35 Jahre polnischer Forschungen im Zentrum des makuritischen Reiches (=Bibliotheca Nubica et Aethiopica 7) (pp. 1–48). Warsaw: ZAŚ PAN. Jakobielski, S. (2001). Das Kloster der Heiligen Dreifaltigkeit. Bauphasen des nordwestlichen Anbaus. In S. Jakobielski and P.O. Scholz (eds), Dongola-Studien: 35 Jahre polnischer Forschungen im Zentrum des makuritischen Reiches (=Bibliotheca Nubica et Aethiopica 7) (pp. 141–168). Warsaw: ZAŚ PAN. Jakobielski, S. (2001). Old Dongola. Season 2000. Polish Archaeology in the Mediterranean, 12, 265–279. Jakobielski, S. and Scholz, P.O. (eds). (2001). Dongola-Studien: 35 Jahre polnischer Forschungen im Zentrum des makuritischen Reiches (=Bibliotheca Nubica et Aethiopica 7). Warsaw: ZAŚ PAN. Łajtar, A. and Pluskota, K. (2001). Inscribed vessels from the Monastery of the Holy Trinity at Old Dongola. In S. Jakobielski and P.O. Scholz (eds), Dongola-Studien: 35 Jahre polnischer Forschungen im Zentrum des makuritischen Reiches (=Bibliotheca Nubica et Aethiopica 7) (pp. 335–355). Warsaw: ZAŚ PAN. Martens-Czarnecka, M. (2001). Nubian king – A painting from the Monastery in Dongola. In S. Jakobielski and P.O. Scholz (eds), Dongola-Studien: 35 Jahre polnischer Forschungen im Zentrum des makuritischen Reiches (=Bibliotheca Nubica et Aethiopica 7) (pp. 285–300). Warsaw: ZAŚ PAN. Martens-Czarnecka, M. (2001). Suggestions on dating of some murals from the Monastery in Old Dongola. Études et Travaux, 19, 217–236. Martens-Czarnecka, M. (2001). Wall paintings discovered in Old Dongola. In S. Jakobielski and P.O. Scholz (eds), Dongola-Studien: 35 Jahre polnischer Forschungen im Zentrum des makuritischen Reiches (=Bibliotheca Nubica et Aethiopica 7) (pp. 253–284). Warsaw: ZAŚ PAN. Pluskota, K. (2001). The kiln sites of Old Dongola. In S. Jakobielski and P.O. Scholz (eds), Dongola-Studien: 35 Jahre polnischer Forschungen im Zentrum des makuritischen Reiches (=Bibliotheca Nubica et Aethiopica 7) (pp. 357–366). Warsaw: ZAŚ PAN. Ryl-Preibisz, I. (2001). Elements of architectural decoration from Old Dongola. In S. Jakobielski and P.O. Scholz (eds), Dongola-Studien: 35 Jahre polnischer Forschungen im Zentrum des makuritischen Reiches (=Bibliotheca Nubica et Aethiopica 7) (pp. 367–387). Warsaw: ZAŚ PAN. Scholz, P.O. (2001). Randbemerkungen zur liturgisch-kultischen Funktion des Xenodochiums des Dreifaltigkeitsklosters in Alt-Dongola. In S. Jakobielski and P.O. Scholz (eds), Dongola-Studien: 35 Jahre polnischer Forschungen im Zentrum des makuritischen Reiches (=Bibliotheca Nubica et Aethiopica 7) (pp. 169–251). Warsaw: ZAŚ PAN. Żurawski, B. (2001). Dongola, the city of the Makurians (literary sources to 1956). In S. Jakobielski and P.O. Scholz (eds), Dongola-Studien: 35 Jahre polnischer Forschungen im Zentrum des makuritischen Reiches (=Bibliotheca Nubica et Aethiopica 7) (pp. 75–141). Warsaw: ZAŚ PAN. Godlewski, W. (2000). Old Dongola. Kom A, 1999. Polish Archaeology in the Mediterranean, 11, 197–206. Jakobielski, S. (2000). Old Dongola. Documentation work in the monastery, 1999. Polish Archaeology in the Mediterranean, 11, 207–208. Godlewski, W. (1999). The earliest evidence of the settlement at Old Dongola. In S. Wenig (ed. ), Studien zum antiken Sudan: Akten der 7. Internationalen Tagung für meroitistische Forschungen von 14. bis 19. September 1992 in Gosen/bei Berlin (=Meroitica 15) (pp. 554–559). Wiesbaden: Harrassowitz. Jakobielski, S. (1999). Old Dongola. Excavations, 1998. Polish Archaeology in the Mediterranean, 10, 137–147. Łaptaś, M. (1999). Comments on wall paintings from “House A” in Old Dongola. In S. Emmel, M. Krause, S.G. Richter, and S. Schaten (eds), Ägypten und Nubien in spätantiker und christlicher Zeit: Akten des 6. Internationalen Koptologenkongresses, Münster, 20.–26. Juli 1996, I. Materielle Kultur, Kunst und religiöses Leben (=Sprachen und Kulturen des christlichen Orients 6) (pp. 230–237). Wiesbaden: Reichert Verlag. Żurawski, B. (1999). Faith healing, philanthropy and commemoration in Late Christian Dongola. In S. Emmel, M. Krause, S.G. Richter, and S. Schaten (eds), Ägypten und Nubien in spätantiker und christlicher Zeit: Akten des 6. Internationalen Koptologenkongresses, Münster, 20.–26. Juli 1996, I. Materielle Kultur, Kunst und religiöses Leben (pp. 423–448). Wiesbaden: Reichert Verlag. Żurawski, B. (1999). The Monastery on Kom H in Old Dongola. The monks’ graves. A preliminary report. Nubica, 4–5, 201–256. Godlewski, W. (1998). Old Dongola, excavations 1997 – Kom A. Polish Archaeology in the Mediterranean, 9, 171–179. Godlewski, W. (1998). The role of Dongolese milieu in the Nubian church architecture. In M. Krause and S. Schaten (eds), Themelia: spätantike und koptologische Studien. Peter Grossmann zum 65. Geburtstag (=Sprachen und Kulturen des christlichen Orients 3)(pp. 127–142). Wiesbaden: Reichert Verlag. Godlewski, W. (1998). Wielkość Dongoli (The greatness of Dongola). Światowit, 41 Fasc. A, 243–249. Jakobielski, S. (1998). Kościoły w Starej Dongoli (The churches in Old Dongola). In B. Iwaszkiewicz-Wronikowska (ed. ), Sympozja Kazimierskie: poświęcone kulturze świata późnego antyku i wczesnego chrześcijaństwa (pp. 277–285). Lublin: Towarzystwo Naukowe Katolickiego Uniwersytetu Lubelskiego. Jakobielski, S. (1998). Old Dongola, excavations 1997. Polish Archaeology in the Mediterranean, 9, 158–159. Jakobielski, S. (1998). Old Dongola, Kom H. Polish Archaeology in the Mediterranean, 9, 160–169. Jakobielski, S. (1998). The Monastery in Old Dongola: Excavations in the Western Annexe 1995–1997. Gdańsk Archaeological Museum African Reports, 1, 55–61. Martens-Czarnecka, M. (1998). An attempt to define the function of selected rooms at the Monastery in Old Dongola. Gdańsk Archaeological Museum African Reports, 1, 81–93. Martens-Czarnecka, M. (1998). Malowidła z klasztoru na Komie H w Starej Dongoli (Wall paintings from the monastery on Kom H in Old Dongola). In B. Iwaszkiewicz-Wronikowska (ed. ), Sympozja Kazimierskie: poświęcone kulturze świata późnego antyku i wczesnego chrześcijaństwa (pp. 71–102). Lublin: Towarzystwo Naukowe Katolickiego Uniwersytetu Lubelskiego. Martens-Czarnecka, M. (1998). Mural paintings from Old Dongola. Gdańsk Archaeological Museum African Reports, 1, 95–113. Godlewski, W. (1997). Old Dongola, Kom A (1996). Polish Archaeology in the Mediterranean, 8, 179–187. Godlewski, W. (1997). Old Dongola: The early fortifications. In Actes de la VIIIe Conférence Internationale des Études Nubiennes: Lille 11–17 septembre 1994, II. Découvertes archéologiques (pp. 175–179). Villeneuve-d’Ascq: Université Charles de Gaulle-Lille III. Jakobielski, S. (1997). Old Dongola, excavations 1996. Polish Archaeology in the Mediterranean, 8, 159–160. Jakobielski, S. (1997). Old Dongola, Kom H, Site NW. Polish Archaeology in the Mediterranean, 8, 161–168. Jakobielski, S. and Łajtar, A. (1997). Ein Glaubensbekenntnis aus Alt Dongola (Sudan). Journal of Juristic Papyrology, 27, 7–26. Łajtar, A. (1997). Greek funerary inscriptions from Old Dongola: General note. Oriens Christianus, 81, 107–126. Łajtar, A. (1997). Psalm 22,1–2 nebst der invocatio Dei auf einem Ostrakon aus Alt Dongola (Sudan). Journal of Juristic Papyrology, 27, 55–60. Martens-Czarnecka, M. (1997). New mural paintings from Old Dongola. In Actes de la VIIIe Conférence Internationale des Études Nubiennes: Lille 11–17 septembre 1994, II. Découvertes archéologiques (pp. 211–226). Villeneuve-d’Ascq: Université Charles de Gaulle–Lille III. Pluskota, K. (1997). Old Dongola: Recent pottery finds. In Actes de la VIIIe Conférence Internationale des Études Nubiennes: Lille 11–17 septembre 1994, II. Découvertes archéologiques (pp. 235–242). Villeneuve-d’Ascq: Université Charles de Gaulle–Lille III. Ryl-Preibisz, I. (1997). Architectural decorative elements recently discovered at Old Dongola. In Actes de la VIIIe Conférence Internationale des Études Nubiennes: Lille 11–17 septembre 1994, II. Découvertes archéologiques (pp. 227–233). Villeneuve-d’Ascq: Université Charles de Gaulle–Lille III. Żurawski, B. (1997). Old Dongola, Kom H, Southwestern Unit. Polish Archaeology in the Mediterranean, 8, 169–178. Żurawski, B. (1997). The cemeteries of Dongola: A preliminary report. In Actes de la VIIIe Conférence Internationale des Études Nubiennes: Lille 11–17 septembre 1994, II. Découvertes archéologiques (pp. 195–209). Villeneuve-d’Ascq: Université Charles de Gaulle–Lille III. Żurawski, B. (1997). The Early Church on Kom E near Old Dongola. Excavations of 1993 and 1994 seasons. In Actes de la VIIIe Conférence Internationale des Études Nubiennes: Lille 11–17 septembre 1994, II. Découvertes archéologiques (pp. 181–194). Villeneuve-d’Ascq: Université Charles de Gaulle–Lille III. Godlewski, W. (1996). Old Dongola. Kom A, 1995. Polish Archaeology in the Mediterranean, 7, 115–120. Jakobielski, S. (1996). Old Dongola. Monastery 1995. Polish Archaeology in the Mediterranean, 7, 103–113. Żurawski, B. (1996). Old Dongola. Cemeteries 1995. Polish Archaeology in the Mediterranean, 7, 121–135. Godlewski, W. (1995). Old Dongola. The fortifications, 1994. Polish Archaeology in the Mediterranean, 6, 93–97. Jakobielski, S. (1995). Dongola – dzieje, archeologia, znaczenie (Dongola – history, archaeology, importance). In M.L. Bernhard (ed. ), Od Nilu do Eufratu: polska archeologia śródziemnomorska 1981–1994 (pp. 76–87). Warsaw: Uniwersytet Warszawski, Centrum Archeologii Śródziemnomorskiej im. prof. Kazimierza Michałowskiego. Jakobielski, S. (1995). Monastery of the Holy Trinity at Old Dongola – A short archaeological report. In M. Starowieyski (ed. ), The spirituality of ancient monasticism: Acts of the International Colloquium, held in Cracow – Tyniec, 16–19th November 1994. Specialized contributions (pp. 35–45). Tyniec: Wydawnictwo Benedyktynów. Jakobielski, S. (1995). Old Dongola 1993/94. Polish Archaeology in the Mediterranean, 6, 84–92. Łajtar, A. (1995). Greek inscriptions from the monastery on Kom H in Old Dongola. In M. Starowieyski (ed. ), The spirituality of ancient monasticism: Acts of the International Colloquium, held in Cracow – Tyniec, 16–19th November 1994. Specialized contributions (pp. 47–61). Tyniec: Wydawnictwo Benedyktynów. Żurawski, B. (1995). Old Dongola 1984–1993. The Mortuary Complex. A preliminary report. Études et Travaux, 17, 327–364. Żurawski, B. (1995). Old Dongola: The mosaic church (Kom E) 1993/94. Polish Archaeology in the Mediterranean, 6, 98–108. Godlewski, W. (1994). Dongola, capitale de la Nubie chrétienne. Dossiers d’Archéologie, 196, 72–77. Godlewski, W. (1994). Old Dongola town fortifications, 1993. Polish Archaeology in the Mediterranean, 5, 129–132. Gołgowski, T. (1994). Baptism or eucharist? Some remarks on the object found in Old Dongola (Sudan). Nubian Letters, 22, 6–9. Jakobielski, S. (1994). Dongola. In Enciclopedia dell’arte antica, classica e orientale. Suppl. 2 (pp. 396–397). Rome: Istituto della Enciclopedia italiana. Jakobielski, S. (1994). Old Dongola 1993. Polish Archaeology in the Mediterranean, 5, 115–128. Jakobielski, S. (1994). Old Dongola, the report on salvage works on Kom H effected in 1990 field season. Kush, 16, 305–333. Jeuté, P. (1994). Glass finds from Old Dongola. In C. Bonnet (ed. ), Études nubiennes: conférence de Genève. Actes du VIIe Congrès international d’études nubiennes, 3–8 septembre 1990, II. Communications (pp. 211–223). Geneva: C. Bonnet. Pluskota, K. (1994). Old Dongola – Kiln R 2: Post-classic Christian pottery deposit. Nubica, 3(1), 361–377. Pluskota, K. (1994). Some remarks on the post-classic Christian pottery from Old Dongola. In C. Bonnet (ed. ), Études nubiennes: conférence de Genève. Actes du VIIe Congrès international d’études nubiennes, 3–8 septembre 1990, II. Communications (pp. 219–220). Geneva: C. Bonnet. Ryl-Preibisz, I. (1994). Some fragments of architectural decoration in Nubia – capitals from Old Dongola. In C. Bonnet (ed. ), Études nubiennes: conférence de Genève. Actes du VIIe Congrès international d’études nubiennes, 3–8 septembre 1990, II. Communications (pp. 259–262). Geneva: C. Bonnet. Żurawski, B. (1994). Some Christian foundation deposits from the region of Old Dongola. In C. Bonnet (ed. ), Études nubiennes: conférence de Genève. Actes du VIIe Congrès international d’études nubiennes, 3–8 septembre 1990, II. Communications (pp. 211–217). Geneva: C. Bonnet. Żurawski, B. (1994). The service area in north-eastern corner of the Monastery on Kom H in Old Dongola. A preliminary report. Nubica, 3(1), 319–360. Żurawski, B. and El-Tayeb, M. (1994). The Christian cemetery of Jebel Ghaddar North. Nubica, 3(1), 297–317. Jakobielski, S. (1993). Old Dongola, 1991–1992. Polish Archaeology in the Mediterranean, 4, 98–110. Jakobielski, S., Pluskota, K., and Żurawski, B. (1993). Polish excavations at Old Dongola, twenty-fifth season 1991/92. Kush, 16, 310–325. Łajtar, A. (1992). Two Greek inscriptions from Polish excavations in Old Dongola in the collection of the National Museum in Warsaw. Aegyptus, 72(1–2), 111–142. Pluskota, K. (1992). A liturgical vessel from Old Dongola. In P.O. Scholz (ed. ), Orbis Aethiopicus: Studia in honorem Stanislaus Chojnacki natali septuagesimo quinto dicata, septuagesimo septimo oblata (=Bibliotheca Nubica 3) (pp. 411–414). Albstadt: K. Schuler. Daszkiewicz, M. and Raabe, J. (1991). Pottery from the kiln site at Old Dongola: Determination of the firing temperature. In W. Godlewski (ed. ), Coptic and Nubian pottery: International workshop, Nieborów August 29–31, 1988, II (=National Museum in Warsaw Occasional Paper 2) (pp. 57–71). Warsaw: National Museum in Warsaw. Dobrowolski, J. (1991). The first church at Site “D” in Old Dongola (Sudan). Archéologie du Nil Moyen, 5, 29–40. Godlewski, W. (1991). Old Dongola 1988–1989. The House PCH.1. Archéologie du Nil Moyen, 5, 79–101. Godlewski, W. (1991). The fortifications of Old Dongola. Report on the 1990 season. Archéologie du Nil Moyen, 5, 103–128. Godlewski, W. (1991). The Old Dongola fortifications. Polish Archaeology in the Mediterranean, 2, 74–77. Jakobielski, S. (1991). Old Dongola 1989–1990. Polish Archaeology in the Mediterranean, 2, 65–73. Łajtar, A. (1991). Two Greek funerary stelae from Polish excavations at Old Dongola. Archéologie du Nil Moyen, 5, 157–166. Pluskota, K. (1991). Dongola. A pottery production centre from the Early Christian Period. In W. Godlewski (ed. ), Coptic and Nubian pottery: International workshop, Nieborów August 29–31, 1988, II (=National Museum in Warsaw Occasional Paper 2) (pp. 34–56). Warsaw: National Museum in Warsaw. Smith, L.M.V. (1991). Pottery from Old Dongola: technical analysis. In W. Godlewski (ed. ), Coptic and Nubian pottery: International workshop, Nieborów August 29­–31, 1988, II (=National Museum in Warsaw Occasional Paper 2) (pp. 72–85). Warsaw: National Museum in Warsaw. Gartkiewicz, P.M. (1990). The Cathedral in Old Dongola and its antecedents (=Nubia 1; Dongola 2). Warsaw: Państwowe Wydawnictwo Naukowe. Godlewski, W. (1990). Old Dongola 1988–1989. The House PCH.1. Polish Archaeology in the Mediterranean, 1, 14–16. Godlewski, W. (1990). The Cruciform Church at Old Dongola (Sudan). Some comments. In W. Godlewski (ed. ), Coptic studies: Acts of the Third International Congress of Coptic Studies, Warsaw, 20–25 August, 1984 (pp. 127–137). Warsaw: PWN. Godlewski, W. (1990). The Cruciform Church site in Old Dongola. Sequence of buildings from the 6th to the 18th century. Nubica, 1/2, 511–534. Godlewski, W. (1990). The Northern Church in Old Dongola. Archéologie du Nil Moyen, 4, 37–62. Jakobielski, S. and Godlewski, W. (1990). Dongola 1978–1980. Études et Travaux, 14, 393–408. Jakobielski, S. and Medeksza, S. (1990). The North-West Church at Old Dongola. In W. Godlewski (ed. ), Coptic studies: Acts of the Third International Congress of Coptic Studies, Warsaw, 20–25 August, 1984 (pp. 165–174). Warsaw: PWN. Martens-Czarnecka, M. (1990). Caractéristiques du style «violet» dans le peinture à Dongola. Études et Travaux, 14, 223–237. Martens-Czarnecka, M. (1990). Some known and some new features of Nubian painting on the murals from House “A” in Old Dongola. In W. Godlewski (ed. ), Coptic studies: Acts of the Third International Congress of Coptic Studies, Warsaw, 20–25 August, 1984 (pp. 233–246). Warsaw: PWN. Medeksza, S. (1990). Remarks on structural engineering in Nubia based upon a study on Christian houses A and B in Old Dongola. Nubica, 1–2, 77–94. Pluskota, K. (1990). Early Christian pottery from Old Dongola. In W. Godlewski (ed. ), Coptic studies: Acts of the Third International Congress of Coptic Studies, Warsaw, 20–25 August, 1984 (pp. 315–333). Warsaw: PWN. Godlewski, W. (1989). Badania archeologiczne w Starej Dongoli (Sudan) w latach 1985–1987. Rocznik Muzeum Narodowego w Warszawie, 33–34, 625–638. Godlewski, W. (1989). Old Dongola, the House PCH.1. Nubian Letters, 13, 1–3. Dobrowolski, J. (1988). Kościół na komie “D” w Starej Dongoli (The church on site “D” in Old Dongola). Kwartalnik Architektury i Urbanistyki: Teoria i Historia, 33(3), 217–231. Dobrowolski, J. (1988). On the first church on Site D in Old Dongola. Nubian Letters, 11, 1–6. Browne, G.M. (1987). Two Old Nubian texts from Old Dongola. Bulletin du Musee National de Varsovie, 28(3–4), 76–86. Dobrowolski, J. (1987). On a recently discovered church in Old Dongola. Nubian Letters, 9, 1–6. Godlewski, W. (1987). The Church of Stone Pavement in Old Dongola. Part II. Nubian Letters, 8, 2–6. Godlewski, W. and Medeksza, S. (1987). The so-called Mosque Building in Old Dongola (Sudan). A structural analysis. Archéologie du Nil Moyen, 2, 185–205. Godlewski, W. (1986). Badania archeologiczne w Starej Dongoli (Sudan) w latach 1983–1984. Rocznik Muzeum Narodowego w Warszawie, 30, 359–378. Kiss, Z. (1986). Un relief romain tardif à Dongola. Rocznik Muzeum Narodowego w Warszawie, 30, 41–46. Jakobielski, S. (1986). Polish excavations at Old Dongola, 1978/79–1982. In M. Krause (ed. ), Nubische Studien: Tagungsakten der 5. Internationalen Konferenz der International Society for Nubian Studies, Heidelberg, 22.–25. September 1982 (pp. 299–304). Mainz am Rhein: Philipp von Zabern. Jakobielski, S. (1986). Stara Dongola (Old Dongola). In Z. Kiss (ed. ), 50 lat polskich wykopalisk w Egipcie i na Bliskim Wschodzie (pp. 91–96). Warsaw: Dom Słowa Polskiego. Jakobielski, S. and Medeksza, S. (1985). The North-West Church in Old Dongola. Nubian Letters, 5, 2–3. Godlewski, W. (1985). Some remarks on the Cruciform Church in Old Dongola (Sudan). Nubian Letters, 4, 20–22. Godlewski, W. (1984). Polskie badania archeologiczne w Starej Dongoli (Sudan) w latach 1981–1982 (Polish excavations at Old Dongola (Sudan) in 1981–­1982). Rocznik Muzeum Narodowego w Warszawie, 28, 465–484. Godlewski, W. (1984). The Church of Stone Pavement in Old Dongola. Nubian Letters, 2, 11–16. Godlewski, W. (1983). Polish excavations at Old Dongola (1980–1983). Nyame Akuma, 23, 27–28. Jakobielski, S. (1983). Dongola. In Encyklopedia katolicka IV (pp. 114–115). Lublin: Towarzystwo Naukowe Katolickiego Uniwersytetu Lubelskiego. Gartkiewicz, P.M. (1982). An introduction to the history of Nubian church architecture. Nubia Christiana, 1, 43–133. Godlewski, W. (1982). Some comments on the wall painting of Christ from Old Dongola. In J.M. Plumley (ed. ), Nubian studies: Proceedings of the Symposium for Nubian Studies, Selwyn College, Cambridge, 1978 (pp. 95–99). Warminster: Aris & Phillips. Godlewski, W. (1982). The mosque building in Old Dongola. In P. van Moorsel (ed. ), New discoveries in Nubia: Proceedings of the Colloquium on Nubian studies, the Hague, 1979 (=Egyptologische uitgaven 2) (pp. 21–28). Leiden: Nederlands Instituut voor het Nabije Oosten. Godlewski, W. (1982). The Throne Hall in Old Dongola (Sudan). Jahrbuch der Österreichischen Byzantinistik, 32, 569–574. Jakobielski, S. (1982). A brief account on the churches at Old Dongola. In P. van Moorsel (ed. ), New discoveries in Nubia: Proceedings of the Colloquium on Nubian studies, the Hague, 1979 (=Egyptologische uitgaven 2). Leiden: Nederlands Instituut voor het Nabije Oosten. Jakobielski, S. (1982). A rock-cut tomb in el-Ghaddar. In N.B. Millet and A.L. Kelley (eds), Meroitic studies: Proceedings of the Third International Meroitic Conference, Toronto, 1977 (=Meroitica 6) (pp. 175–177). Berlin: Akademie-Verlag. Jakobielski, S. (1982). Polish excavations at Old Dongola in 1976 and 1978. In J.M. Plumley (ed. ), Nubian studies: Proceedings of the Symposium for Nubian Studies, Selwyn College, Cambridge, 1978 (pp. 116–126). Warminster: Aris & Phillips. Promińska, E. (1982). Changements pathologiques des squelettes découverts dans les églises de Dongola. In P. van Moorsel (ed. ), New discoveries in Nubia: Proceedings of the Colloquium on Nubian studies, the Hague, 1979 (pp. 111–112). Leiden: Nederlands Instituut voor het Nabije Oosten. Godlewski, W. (1981). Throne Hall at Old Dongola (the Sudan). Africana Bulletin, 30, 39–51. Jakobielski, S. and Godlewski, W. (1981). Od Faras do Dongoli (From Faras to Dongola). Meander, 36(6), 351–355. Gartkiewicz, P.M. (1980). New outline of the history of Nubian church architecture. Bulletin Antieke Beschaving, 55(1), 137–160. Promińska, E. (1980). Changements pathologiques des squelettes découverts dans les églises de Dongola. Antropologia Contemporanea, 3, 153–156. Godlewski, W. (1979). Le baptistère de l’église au dallage de pierre à Dongola. Études et Travaux, 11, 139–150. Godlewski, W. (1979). Les baptistères nubiens (=Faras 6). Warsaw: Éditions scientifiques de Pologne. Jakobielski, S. (1979). Dongola 1976. Études et Travaux, 11, 229–244. Promińska, E. (1979). Human skeletal remains from the Church of the Granite Columns and the Cruciform Church at Old Dongola. Études et Travaux, 11, 151–178. Dzierżykray-Rogalski, T. and Promińska, E. (1978). Tombeaux de deux dignitaires chrétiens dans l’eglise cruciforme de Dongola. In Études nubiennes: colloque de Chantilly, 2–6 juillet 1975 (pp. 91–94). Cairo: Institut français d’archéologie orientale. Godlewski, W. (1978). Le baptistère de la Vieille Eglise à Dongola. Études et Travaux, 10, 363–374. Jakobielski, S. (1978). Dongola 1974. Études et Travaux, 10, 407–416. Jakobielski, S. (1978). Polish excavations at Old Dongola, 1973 and 1974 seasons. In Études nubiennes: colloque de Chantilly, 2–6 juillet 1975 (pp. 129–140). Cairo: Institut français d’archéologie orientale. Promińska, E. (1978). Les ossements des tombes des églises de Dongola. In Études nubiennes: colloque de Chantilly, 2–6 juillet 1975 (pp. 243–246). Cairo: Institut français d’archéologie orientale. Promińska, E. (1976). Badania antropologiczne w Starej Dongoli (Sudan) (Anthropological investigations in Old Dongola (Sudan)). In A. Malinowski (ed. ), Badania populacji ludzkich na materiałach współczesnych i historycznych: materiały z naukowej sesji antropologicznej w dniu 17 X 1975 (pp. 179–182). Poznań: Wydawnictwo Naukowe Uniwersytetu im. Adama Mickiewicza. Dzierżykray-Rogalski, T. and Jakobielski, S. (1975). La tombe de l’Eparque Yoannès dans l’Église à Colonnes en Granit de Dongola (Soudan). In K. Michałowski (ed. ), Nubia: récentes recherches. Actes du Colloque nubiologique international au Musée national de Varsovie 19–22 Juin 1972 (pp. 44–48). Warsaw: National Museum in Warsaw. Gartkiewicz, P.M. (1975). The central plan in Nubian church architecture. In K. Michałowski (ed. ), Nubia: récentes recherches. Actes du Colloque nubiologique international au Musée national de Varsovie 19–22 Juin 1972 (pp. 49–64). Warsaw: National Museum in Warsaw. Jakobielski, S. (1975). Polish excavations at Old Dongola, 1970–1972. In K. Michałowski (ed. ), Nubia: récentes recherches. Actes du Colloque nubiologique international au Musée national de Varsovie 19–22 Juin 1972 (pp. 70–75). Warsaw: National Museum in Warsaw. Kołodziejczyk, K. (1975). Remarks on the stamped Dongola ware from Faras. Études et Travaux, 8, 315–321. Zagrodzki, T. (1975). Principes mathématiques du plan des deux églises découvertes en 1968, 1971 et 1972 à Dongola. Études et Travaux, 8, 301–313. Gartkiewicz, P.M. (1973). Stary kościół w Dongoli na tle sakralnej architektury wczesnośredniowiecznej Nubii (The Old Church in Dongola against the background of sacral architecture in early medieval Nubia). Kwartalnik Architektury i Urbanistyki: Teoria i Historia, 18(3/4), 207–239. Godlewski, W. (1973). Dongola – stolica chrześcijańskiej Nubii (Dongola – the capital of Christian Nubia). Z Otchłani Wieków, 39(4), 296–303. Martens, M. (1973). Dongola. Études et Travaux, 7, 263–268. Szolc, P. (1973). Polnische Ausgrabungen in Alt-Dongola im Jahre 1972. Ein Überblick. Archäologischer Anzeiger, 1, 138–142. Kołodziejczyk, K. (1971). A tabernacle from Dongola. Études et Travaux, 5, 244–246. Jakobielski, S. (1970). Polish excavations at Old Dongola, 1969. In E. Dinkler (ed. ), Kunst und Geschichte Nubiens in christlicher Zeit: Ergebnisse und Probleme auf Grund der jüngsten Ausgrabungen (pp. 171–180). Recklinghausen: A. Bongers. Michałowski, K. (1970). Les fouilles polonaises à Dongola. In E. Dinkler (ed. ), Kunst und Geschichte Nubiens in christlicher Zeit: Ergebnisse und Probleme auf Grund der jüngsten Ausgrabungen (pp. 163–170). Recklinghausen: A. Bongers. Michałowski, K. (1969). La mosquée de Dongola au Soudan. Archéologia, 29, 30–33. Jakobielski, S. and Krzyżaniak, L. (1967). Polish excavations at Old Dongola. Third season, December 1966 – February 1967. Kush, 15, 143–164. Jakobielski, S. and Ostrasz, A. (1967–1968). Polish excavations at Old Dongola. Second season, December 1965 – February 1966. Kush, 15, 125–142. Michałowski, K. (1966). Polish excavations at Old Dongola: First season, November–December 1964. Kush, 14, 289–299. Ostrasz, A. (1965). Pierwsza kampania wykopaliskowa w Starej Dongoli (Sudan) (The first season of excavations in Old Dongola (Sudan)). Meander, 20(11–12), 451–461, 466.